Join expert knitter Asa and fellow knitters as we knit something fabulous for the season. The knit-along is held every Saturday, and is free, fun, and a great way to meet new and interesting folks. 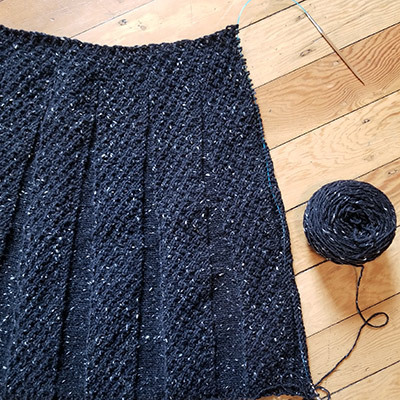 We are now knitting the fabulous Carnaby skirt that you may have seen Yvonne and others wear. If you a little guidance, no problem! Join Asa for instruction from 10:00 to 11:00 am. She can help you with any sticky parts of the pattern plus help you fix any mistakes. The knit-along is free, and the instruction from 10:00 to 11:00 am (if you need it) is just $15.